My waterproofs were starting to look a bit tatty after a good few years of faithful service (although a bit like Trigger’s broom, the jacket is the same but I’m on about my third bib n brace) so when Bait-Tech announced a clothing range would soon be available from Reel Elite Apparel, I decided to have a look. It wasn’t cheap but quality never is. 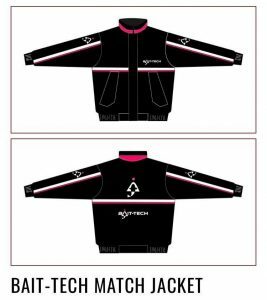 The design drawings looked amazing so I contacted them in early January and ordered the Match Jacket, Bib n Brace and Windstopper Fleece. During the entire order process, the Reel Elite team kept me updated on the progress of my order although it did take a little longer than anticipated to arrive. 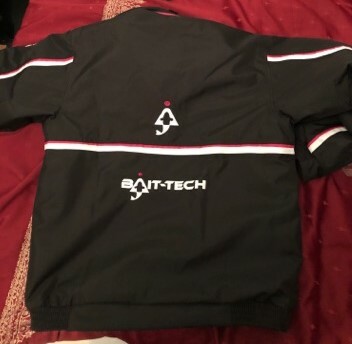 I think I was the first person to order the new Bait-Tech gear and I have to say I was well impressed, the jacket looked fantastic and features a 100% waterproof outer layer and has a lined inner and a peaked hood. A nice little touch is the deep inner pocket which has earphone access for people who like to use their phone or listen to music while fishing. 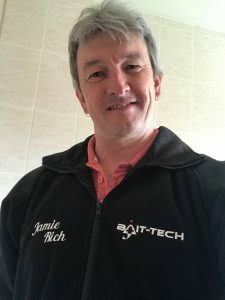 Similarly, the bib n brace looked the business with the Bait-Tech colour scheme and logos and has several pockets, I also had my name embroidered on all three items and there are several different options available, starting at £7. 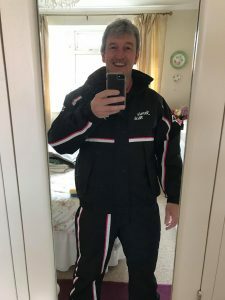 The Windstopper also looked really smart although after trying it on, it was a little, shall we say, snug, around my midriff and I probably should have gone for XL. It has loads of features including padded shoulders and also padded waterproof elbows which are ideal when fishing the pole. I was a little disappointed there wasn’t an inside pocket though. So it certainly looks the part but I haven’t actually worn it outside the house yet! It’s too nice to get dirty! Once its been exposed to the elements for a bit (which won’t be long knowing the British weather! ), I’ll update this post. Check out the website Reel Elite for prices and more details on the range which also includes a 3/4 jacket, overtrousers and a kagool.